However, keep in mind that maintaining the appropriate level of contact can be challenging, according to Realtor Magazine. While doing nothing - or very little - to stay in touch can make it seem like you don't care, doing the opposite and being too hands-on can certainly rub clients the wrong way. Using the right actions - which will make them feel important instead of just being walking dollar signs - is crucial. How you make clients feel is crucial. Ideally, they will get the sense they are valued and important. In an Inman blog post, expert Wendy English quoted Maya Angelou, a well-known American author. "I've learned that people will forget what you said, people will forget what you did, but people will never forget how you made them feel," said Angelou. While making sure your clients feel valued is important, keep in mind that any relationship you have with them will hinge largely on your market knowledge. What good is it to be a rock star at keeping in touch with your customers if you don't have the proper information? To be sure you are ready by having the right information, including mortgage records and warranty deeds, use CRS Data. For more detail on CRS Data, click here. Once you have gathered the information required to be effective in your particular market, it is time to invest some energy into staying in touch with clients. You may be unsure how to make this happen. Fortunately, there are many useful techniques you can leverage. To show your clients you value the personal relationship with them, try sending some greetings cards on dates that will stand out, recommends English. One approach is to send them one of these cards on the anniversary of their purchase date. 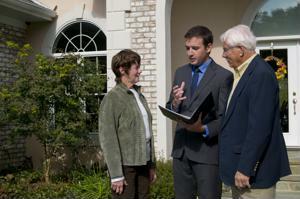 As long as the transaction was a good experience, reminding them of the deal will provide a positive feeling. There are other times that can work out well, she notes. For example, it is easy to find out someone's birthday, and send them a card for that special day. Another simply way to stay in touch in a timely manner is to send cards for the holidays. One way you can keep in touch - and deliver a strong value - is providing valuable information, according to Realtor Magazine. Professionals should emphasize the crucial nature of every communication, offering only information that relates to the client, states Cheryl Hanna, a real estate professional and blogger.